Starting in Longyearbyen, we leave civilisation behind. Our aim is to sail this remote polar region in order to experience the Arctic wilderness, drift ice, flora and fauna. Our final itinerary is dependant on weather and ice conditions, which have to be assessed during the voyage. The Gulf Stream has allowed the island's 400 km long western coastline to become incredibly rich in animal and plant life, while the remote east is forever under the grips of the arctic winter environment. Some years it is possible to sail through the Hinlopen Strait to attempt a circumnavigation of the archipelago, while other years there is a great deal of ice, which makes it harder to navigate around. most out of the experience, as well as recounting tales of Svalbard's cultural and exciting polar explorative heritage - traces of this rich history can be found on several of the excursions, when we go ashore. The further north that we sail, the more ice we will meet, and this ice will gradually build up into large ice floes with seals resting on them. This is polar bear country, where the bears hunt for food, here is your best chance of seeing the 'King of the Arctic' in his natural habitat. In Spring there are large ice floes and the richest bird life. Get your first glimpses of the midnight sun in Spitsbergen's capital Longyearbyen. Embark the M Expedition in the afternoon and depart Longyearbyen in the evening. Each day will be planned to take advantage of local ice and weather conditions. Svalbard is one of the few places on the planet to offer so many natural and historical extravaganzas. We will spend the next eight days exploring the remote polar regions. Visit ice covered fjords with breathtaking mountain scenery and glaciers crashing into the sea around us. Spend time steaming through the ice in search of polar bears hunting seals. At one or more of the stops, we hope to see one of Svalbard's species of reindeer. Some years it is possible to sail through the Hinlopen Strait to attempt a circumnavigation of the archipelago early in the season, while other years there is a great deal of ice, which makes it harder to navigate around. We recommend the early tours for those who are keen to see large ice floes and the richest bird life. For those who would rather travel further east with the chance to sail around Spitsbergen, we recommend a tour later in the season. The final itinerary is dependent on ice and weather conditions, which have to be assessed during the voyage. Krossfjord, Konigsfjord, Monaco Glacier, Edgeoya, Hornsund and Bellsund, are just a few of the places that we may visit, depending on ice and weather. We hope to cruise in zodiacs along the ice edge, viewing seals, walrus or polar bears and in fjords with glaciers spilling down to the sea. We'll enjoy spectacular seabird cliffs from the edge of a Zodiac, as well as walks on shore, enjoying the arctic flora and fauna. Being in the land of the polar bear, your expedition staff will carry rifles and flare guns on shore for your protection. We take on an expedition spirit by not having a set itinerary and are free to take advantage of the best that Svalbard has to offer. Whilst people are initially drawn to this region for polar bears, Spitsbergen also has a prolific birdlife on offer. Enjoy the spectacular bird cliffs, filled with thousands of murres (guillemots), as well as kittiwakes and glaucous gulls and soak up the sound of these chirping, feathered creatures. A little auk colony will also be on our agenda. 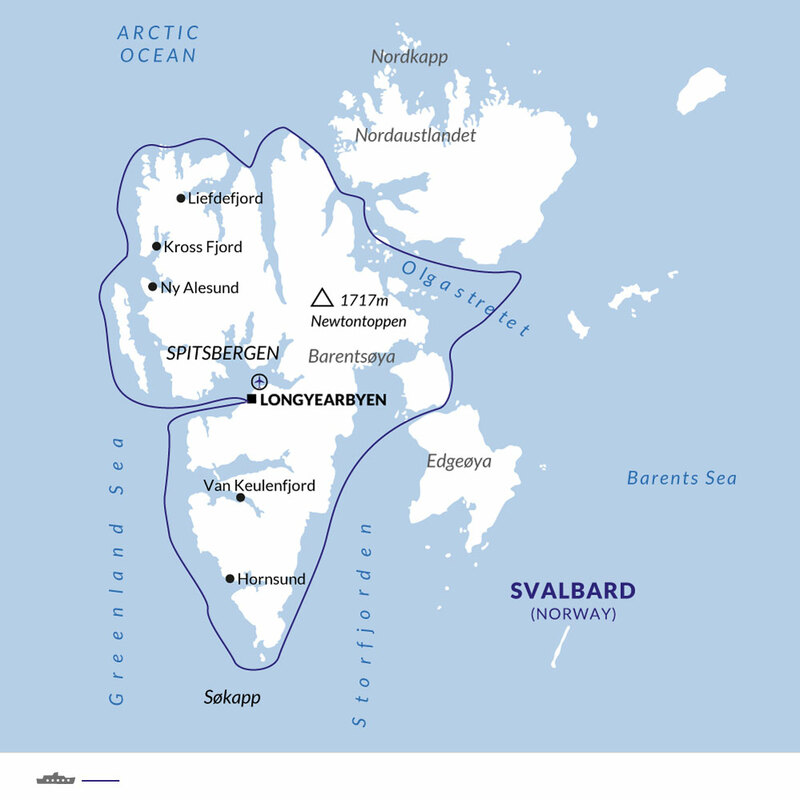 The Svalbard region is a land of history: from whaling to reaching for the pole, to trapping, coal mining and war. There is some evidence of the whaling industry on some of the landings and the on-board lectures, will give you a bit more insight into the history of this region. We will aim to get off the ship twice daily, either on a Zodiac cruise or on a landing. The sea time will be spent enjoying more informative lectures on board, delivered by our exceedingly knowledgeable expedition crew. We will spend time in zodiacs, cruising around the iceflows and may encounter some lounging walrus with their young. There will be more landings, with different options for walks, to suit all members of the group. The walks are normally divided into slow, medium and fast paced groups and depending on whether you want to take photographs near the beachfront, or hike up to the highest point, you can vary which option you choose each day. More time to soak up this exhilerating glacial scenery and it's fresh Arctic air. After our last full day of adventure, soaking up the sights of the Arctic wilderness, we will anchor off Longyearbyen in the evening and enjoy our final night aboard the ship, recounting tales of our week-long adventure. We arrive in Longyearbyen in the early morning for disembarkation. To add to your polar adventure, kayaking is available as an optional excursion on some of our departures from GBP 509 per person. This optional extra is only available if you book prior to departure - please speak to one of our polar experts for availability and to reserve your place. for your time in Norway pre-cruise. Credit Card Acceptance: Credit cards are useful and can be used in many places, but may be subject to a service charge. The ship accepts Visa and Mastercard. Additional information: There is a chit system on board the ship, with bills settled on the final night of the voyage. Please note that only US Dollars and credit cards are accepted on board. Information General disembarkation from the vessel is at approximately 8:00am. You will be transferred to either the airport or the Radisson Blu Polar hotel, depending on the time of your flight. Those transferred to the hotel will have an opportunity to explore the town centre on their own and then be transferred to the airport later in the day, as per flight schedules. Transfer times will be confirmed and communicated on board prior to departure. Luggage storage at the Radisson Blu Polar hotel will be available until your time of departure. Due to restrictive airline schedules for flights departing from Longyearbyen, we are pleased to offer an early morning disembarkation and transfer to the airport for those passengers with flights departing Longyearbyen around 2:30am, depending on airline schedules.